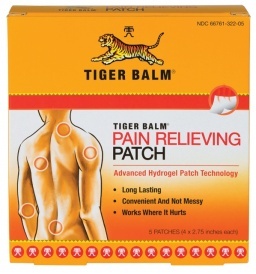 Tiger Balm Pain Relieving Patches provide strong and convenient pain relief for hours with minimal odor. They’re not messy or greasy, and will not stain clothing. The ventilated hydrogel patch contours to your body to deliver optimal comfort and relief, and the pull-and-peel protective film makes it easy to apply and painless to remove. Tiger Balm Pain Relieving Patches are available in two sizes, and come in a reusable zip pouch for convenient storage and use. I am always on the lookout for any kind of pain relievers I can find, that do not come in pill form. I have chronic back pain along with carpal tunnel andÂ a few other health related issues that have my body screaming at times for some help! I was contacted to review this Tiger Balm patch for you, and I have to say it is rated right up there on my NEED list! As soon as I put it on, I could smell the menthol and camphor, so those smells always mean to me, that this will be a product that works! It also has Capsicum extract, which you can knock me over with a feather because I have no idea what it is, but I do know that adding this in with the camphor and menthol equals a TRUE PAIN RELIEF PATCH! I slipped one on my hip for my first use, which is my main pain source, and it went to work immediately! I could feel the medicine literally deep into my muscles! Soothing my sharp pains down to a dull barely noticeable ache! I had to stretch and move around just to see if I actually had any pain! NOW THAT’S AMAZING! It was still working like a charm 3 hours later even, and I couldn’t believe it! Really?! Where has this been all my life? Tiger Balm has actually even been around for over 100 years! WHat a shocker to me! Now if I could only get them in body covering sizes!! LOL!! The Tiger Balm pain patch is way different then others I have used before as it is thicker and made out of a soft gel like product, that is non greasy, but way more pliable and comfortable to wear then others I have tried! SPECIAL GIVEAWAY:You can enter to win a trip for two to beautiful Mendocino County in Northern California by entering the Tiger Balm Sweepstakes. The entry form can be found by â€œLikingâ€ their Facebook page! Tiger Balm is providing 2 of my readers a free box of Patches to try out and see what you think about them! Enter on the Rafflecopter below for your chance to win! I don’t need them often, my knees are just starting to cause me problems. I have sarcoidosis, fibromyalgia, 2 knee replacements and arthritis. I frequently use some form of pain relief. I am trying not to take oral medication and these patches would be wonderful. I have lower back pain two or three times a week. But usually I just try to deal with it, so I’d say I only use pain relievers once or twice a month.